Danielle Nicole Panabaker is an American actress. She began acting as a teenager and first came to prominence for her roles in the Disney films Stuck in the Suburbs, Sky High and Read It and Weep, the latter alongside her younger sister Kay Panabaker, and in the HBO miniseries Empire Falls. She came to wider attention as a cast member alongside James Woods in the CBS legal drama series Shark and is also noted as a Scream Queen, having starred in the horror films Mr. Brooks, Friday the 13th, The Crazies, John Carpenter's The Ward and Piranha 3DD. After recurring roles on the crime series Bones, the drama series Necessary Roughness and the crime drama Justified, Panabaker guest-starred as Caitlin Snow on The CW television series Arrow in April 2014. She is reprising her role as one of the main characters in the spin-off series The Flash, which premièred in October 2014. I'm Danielle Panabaker, actress from THE FLASH, SKY HIGH and horror movies like Friday the 13th and The Crazies. THE FLASH season finale is May 19th... so I'm looking forward to answering as many of your questions as I can! Victoria's helping me get started over the phone today. AMA! why do you make so many funny faces? Danielle, why is "Sky High" so watchable even today? It seems like if it's on the TV, I tend to watch a good chunk before returning to whatever I was doing before! Also, is there something about Panabakers and heroes? You in "Flash" and "Sky High" and your sister in "No Ordinary Family"...any other Panabakers out there saving the world? I love Sky High too! So thank you. I think that everyone can relate to those awkward years of being in high school, and a lot of the emotions are the same, whether you have super powers or not! My sister and I are the only Panabakers I know about right now saving the world - but hopefully there are others out there, too! On the Flash, since Harrison Wells is no longer with STAR Labs, is Caitlin the de facto Director as a result of being the most senior scientist? And if she is, can she get STAR Labs better security? Have a wonderful rest of your day. I'm not sure Caitlin will be the director. Team Flash seems to work together pretty well, hopefully that will continue. But we DEFINITELY need a new security guard! Who is your favourite Flash villain to work with so far, excluding Eobard? Hi Danielle, love the show! yes - from the beginning I knew that Caitlin Snow becomes Killer Frost. And I can't wait to suit up and duke it out with the boys! Where do STAR labs' prisoners go to the bathroom?? Hey Danielle, you did an amazing job in Sky High (not everyone can out-cute Mary Elizabeth Winstead). I'll keep it short and sweet, if you could have any TWO superpowers, what would they be? Bonus karma for good synergy! Keep up the classy work, cheers! Being invisible, and being able to teleport! Hi, Danielle. Can we expect return of Tom in the future seasons? Watch the season finale on Tuesday! Hi Danielle! Is Tom Cavanagh fun to be around in the set? Why are your characters dating the hot guys? Literally, Warren Peace and Firestorm? Both have something to do with fire? Hello Danielle! Huge fan of the Flash (as evidenced by my username). You do a killer job. Just wondering, you play such a likable character and I definitely get the vibe that you and the cast are like family, what are your thoughts towards potentially sporting a colder demeanor and treading the dark side? I can't wait to see the show! I met Melissa this week and she seems so sweet. I think it's going to be wonderful and can't wait to watch. This may seem like a dumb question, but I always wondered what do the characters in the background speak? You know the ones we can see but can't hear? Do they talk ... Real life stuff or in-character stuff? What do you think of Legends of Tomorrow and will you be in it much? What would you say is Caitlin's mood at the end of the Flash finale? From Sky High to The Flash my god you've come a long way. Been watching you since I was a kid. My question is: What is an average Friday night for you? Killer Frost VS Flash, who would win??? Hi Danielle! Just wanted to say that Dr. Snow is my favorite character on the Flash! What does a usual day look like on set when filming the Flash? Are there are a lot of jokes, pranks, etc. going on or is it a very serious, no-jokes, etc. set? Do you watch the Flash TV show? I know - Weird question, but Jared Padalecki said at a recent Supernatural Convention that when Supernatural is over, he would look to binge-watch his own show because he's never really sat down and watched full episodes before. On the other hand, Rose McIver from iZombie watches each episode of iZombie and often live-tweets on Twitter as she watches. Are you the type of actress to watch her work or not watch her work? Do you watch any other CW shows like iZombie, Supernatural, Arrow, The Vampire Diaries, etc.? Or any other T.V. shows in general? Aside from the Green Arrow cast, have you met any of the main characters from other CW shows like Jensen Ackles or Rose McIver since their shows are filmed in Vancouver too? Supernatural is headed toward its 11th season. Do you hope the Flash accomplishes the same success? Can you see yourself attached to one TV show for 11 straight seasons? Or would that be too physically and mentally draining? Thank you and stay awesome! Hi! Each day varies. If we are in Star Labs and shooting on stage, we have a lot of fun; Grant tends to tap dance his way through the day, and there's often spontaneous singing. Days on location (especially when its raining can be a lot tougher). I do watch the Flash. I try to watch the episodes live, but I am usually shooting so that's not possible. Particularly in our first season I have enjoyed seeing how the different directors shoot each episodes. Who is the biggest prankster on the Flash set? If you were locked in a meta human prison for frosty reasons, what your daily food requests be? Danielle, if you got to choose one moment from sets of The Flash that you could replay again, what would you pick? Are you currently working on anything other that The Flash or Legends Of Tomorrow? Time Lapse is in theaters this Friday! Other than that, just enjoying a little bit of a break! What is the pizza of your dreams? Burrata cheese and ricotta cheese... and just lots of cheese! Hey! Thank you for it! we know - Caitlin's flashbacks have been deleted from some past episodes. Can you tell us - what's in them? Do you think you'll get more action scenes in the future? I loved to see you firing guns on "Bones"! Thanks! I really hope so. We have an awesome stunt crew and I can't wait to work with them more! Hi, Big fan from Wales.... If you could go back in time and take a selfie with one person which WON'T destroy the time stream, who would it be? (that's someone I actually met). Otherwise... maybe Bill Gates? Does your last name mean your ancestors were breadmakers? I hope so! I love baking so maybe it was in my genes? I actually haven't seen you in anything but The Flash, but I absolutely love you in it, and I've loved watching Caitlin grow and change as a character through the first season. My favourite scene with you was when Caitlin and Barry went and did Karaoke and then Barry took Caitlin home and looked after her. 1) Did Grant take a peek? 2) Do we get any more awesome Snowbarry scenes? 1 you'd have to ask Grant! 2 get ready for some snowstorm! Looking forward to your appearance this weekend at the Atlantic City Comic Con. Besides the photo op on Saturday, will you also have an area for autographs somewhere? I'll be there all day on Saturday! Hey Danielle, thanks for coming on today, it's really awesome of you! I'm Anna, well done on a fantastic first season and on bringing Caitlin Snow to life, I absolutely LOVE HER so much, and your acting is wonderful (your facial expressions make my day)! Also, anything at all you can tease about the finale? Not necessarily spoilery, just anything at all to help me survive the waiting until next week? I really hope Caitlin will be on Legends of Tomorrow. From watching you on Flash I discovered Shark. Would you ever do a reunion project a la Veronica Mars? Hi Danielle! I love the Flash TV show. Are you a comic book fan, or did you come into the show not knowing much about the world of Barry Allen? Yes. They have made a Killer Frost costume. 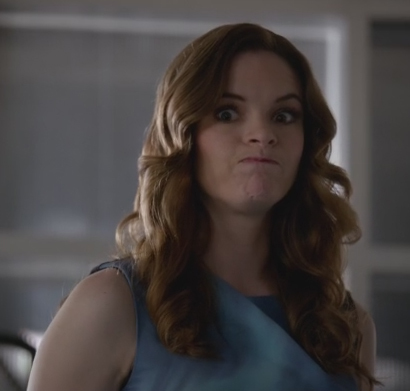 Could Caitlin beat up Cisco? Also, did you ever get out of the suburbs? and I think so! what do you think? I hope so! Did you see the one about feeding the meta humans? 1)Who is the biggest jokster on the set? 2)What would the title of your memoirs be? 2) Is it too soon to eat again? I loved Mr Brooks, so I have to know, in your opinion, do you end up being a serial killer in the end? Could there be a sequel? If you could describe the finale in one word, what would it be? Is there any song that makes you remind Caitlin? Is Grant less 'connected' in the cast? He's never in any for-fun videos like the rest of you. No, he's just much busier than the rest of the cast. I heard that when auditioning, some people on Arrow/Flash didn’t know exactly who they were trying and were given “codenames”. Did you know beforehand? And did you do any comic research to prepare for the role? I always knew I was meeting on the role of Caitlin Snow aka Killer Frost. I did a little research, but there isn't much about her out there (compared to other characters) so I was lucky enough to make her my own! Thank you for doing this. Big fan of course and while I love the flash I have a question about one of my other favorite shows. How was your experience working on justified? Also, would you ever do a meet and greet type thing in Naperville, seeing that you graduated from there? I loved being on Justified - working with Joelle was a dream. She was so sweet and welcoming and a joy to work with. It was also a treat to see Timothy Olyphant on set, even though we didn't get to work together! Hi Danielle, how's your sister Kay? When I started watching the flash I assumed it was Kay playing Caitlin 'till I looked it up. You guys look identical! Hey Danielle, love the Flash. What would be the best 'Flash' related pick up line you know that I can use for tinder? And which actor would you like to see come on the show in the future? Will Tom play a non-evil Wells in season 2? Would you rather be the Flash, the Arrow or Ra's al ghul? So you like ice cream? After every episode of The Flash whose review/ reaction you look forward to the most? If you don't know the words to a song, do you improvise? Which countries you would be visiting, if you has a lot of time? hi danielle, i love caitlin on the flash and was wondering if you frequent the /r/FlashTV subreddit? also was there any talks of a sky high 2 happening? thank you for doing this. Hey Danielle! Congrats on a great season 1 and good luck with season 2. My question is what episode did you have the most fun making? Mr Brooks was amazing! Whatever happened to a sequel? Sadly, the financiers didn't make one! Hey Danielle, really glad you're doing this AMA. What has been the most fun thing you've done while shooting for the Flash?